We departed LaGuardia Airport at 10:20 am for our next stop to Newfoundland . After 20 minutes of weave our way through a few active cells on the west side of Boston , we made to the clear blue sky. We had a very smooth ride and arrived in icy Goose Bay at 4:30 pm. 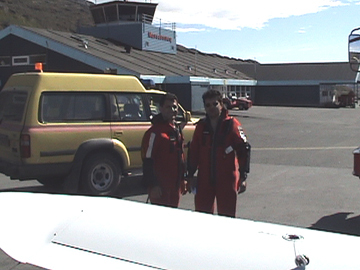 We made our first leg across the North Atlantic from Goose Bay to Narsarsuaq. Climbing to 11000 feet and leaving the land behind you for icy water of North Atlantic was a bit nerve wreaking, but the flight was smooth. 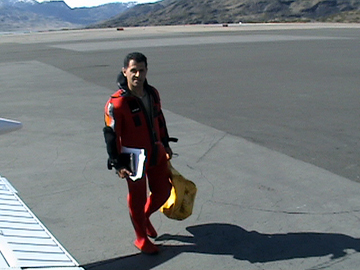 We were unable to establish radio communication with Gander control, using our HF radio; however, at 11000 feet we were able to make contact them with our VHF radio. 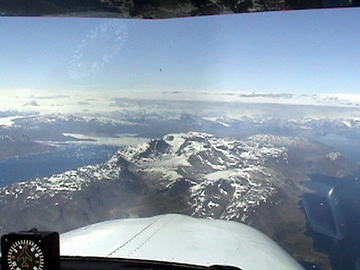 Approaching Greenland and seeing icebergs and towering rocky coast of Greenland is breath taking. It is truly a nature masterpiece. It was the most difficult landing. 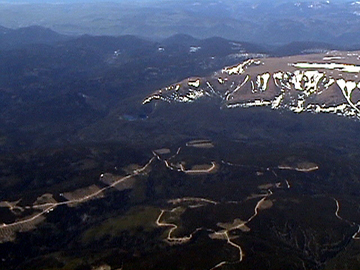 Due to high mountains around the airport, we had to descent from 10000 to 900 feet in 5 mile final approach and land. 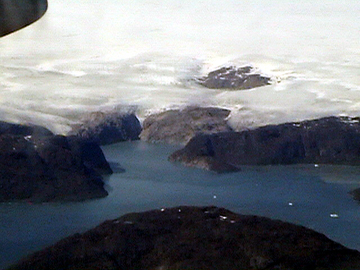 Runway starts perpendicular to edge of the water and we had to duck a few icebergs on final approach, before landing. 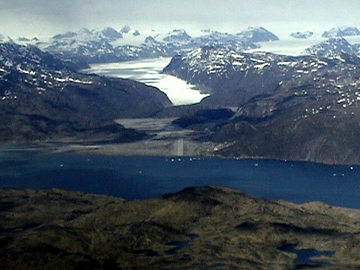 You can see the runway in the picture below. This picture was taken on our final approach. After landing and parking, we notice a little engine oil on the belly of the plane. We cleaned up the oil and tried to find the source, but it was hard to find where it was coming from. We will check it again tomorrow. We may be delayed a few days. 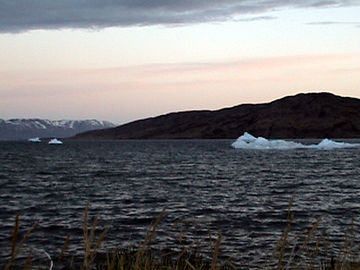 This time of the year, sun will set about 9:30 and rise aging at about 3:00 am in Greenland . This is a difficult concept to get use to. We checked the aircraft this morning to find the source of the oil. The small amount of oil we had on the belly of the plane yesterday was from the starter and a loss bolt. 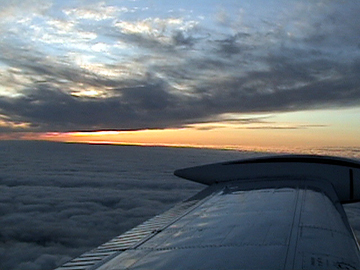 It was an easy fix and we departed Nasarsauq about 5 pm for the second leg of our cross Atlantic flight. We landed at Reykjavik, Iceland at 11:30 pm. It was a smooth ride, but we had to clime to 13000 feed to avoid building ice. We had to do an instrument approach landing at Reykjavik due to low ceiling. 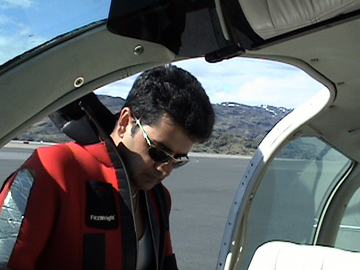 We brook out of the clouds at 700 feed and landed without any problem. It is 12:00 o’clock at night and it is still light outside. 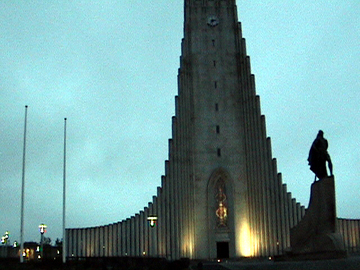 In Iceland , even after sun goes down at 10 pm, it remains light all night. It appears that the sun never leave Iceland .